MTA Metro-North Railroad announced details of a sweeping series of reforms it is undertaking to better ensure the safety of its customers and employees. The reforms address factors identified during several serious safety incidents over the last year, as well as issues identified by an in-depth Federal Railroad Administration (FRA) review of its operating practices that took place this past winter. The reforms touch virtually every aspect of Metro-North’s operations. Among the key overarching actions, Metro-North is engaging in comprehensive outreach to ensure that all employees understand that safety is the foundation of the railroad, and its undisputed first priority. The railroad is reorganizing the Safety Department, centralizing oversight of all training functions at Metro-North in the Training & Development Department to reduce fragmentation, and establishing a work plan to address each directed actions identified in the FRA review. “Safety is the top priority for Metro-North Railroad, above even on-time performance,” said Metro-North Railroad President Joseph Giulietti. Safety Stand-Downs: more than 8,000 employees participated in railroad-wide safety stand downs. These exercises, in which all employees at a work site stop work and discuss safety protocols with supervisors and managers, will be repeated at least once every quarter. Enhanced Employee Protection System: To greatly reduce the risk of an injury or fatality to track workers, this system was designed and implemented to provide workers on tracks with the ultimate authority over when a track is taken out of service and restored to service. Speed Reductions: With the issuance of FRA Emergency Order 29, Metro-North made reductions in maximum authorized speeds across our operating territory, so that no location requires a reduction in speed of greater than 20 miles per hour. At five critical curves and five moveable bridges, modifications were made to the signal system so that compliance with these speed reductions is controlled and enforced automatically. 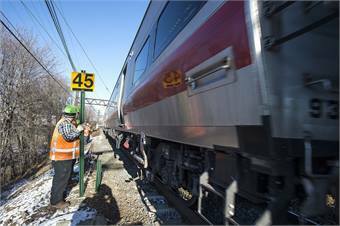 Alerters: Two-thirds of Metro-North’s railcar fleet is outfitted with “Alerters,” equipment that ensures that the engineer of a train is responsive while operating a train. The railroad has designed and procured Alerters for installation in its older railcars this year. Positive Train Control and Cab Cameras: Metro-North, with the LIRR, has expedited the implementation of positive train control, and the process has begun to purchase and install inward- and outward-facing cameras to assist in incident investigations. C3RS: Metro-North, in partnership with its labor organizations, is negotiating participation in in the FRA’s Confidential Close Call Reporting System, which allows employees to anonymously report any safety-related issues they may see on the job. Automated Track Inspection: Metro-North has developed a comprehensive automated track inspection plan. This plan includes the use of track geometry measurements, machine vision track inspection, and rail internal defect testing. These efforts will augment the visual inspections conducted by the railroad. Metro-North is purchasing an autonomous track monitoring system to be mounted on passenger rail cars, to provide continuous information about the condition of the right-of-way. The railroad will also obtain a dedicated track geometry vehicle. More than 60 experts comprising 14 teams from the FRA conducted the 60-day comprehensive safety assessment. The review analyzed Metro-North’s safety-related processes and procedures, its compliance with safety regulations and requirements, and its overall safety culture. The result was a report issued on March 14 that recommended or directed Metro-North to take more than 27 specific actions within eight categories: track safety, railroad operating rules, qualification and certification for engineers and conductors, workplace safety, train control systems, blue signal protection for employees, Operations Control Center and track worker fatigue. Out of the 27 actions detailed in the report, Metro-North has completed 14, is progressing on five, and for eight has developed a training strategy to be carried out starting immediately.